Assign staff to areas of your prison. Deployment lets you manage several aspects of your prison. 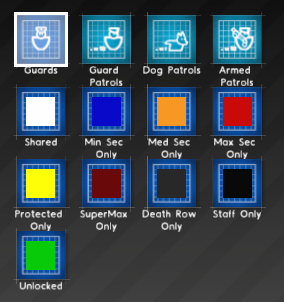 You can set sector permissions, assign guards to sectors and set jobs to dedicated rooms. The deployment screen must be researched through the bureaucracy system. The chief is a prerequisite to the research. Once the research is complete, the deployment tab on the main toolbar will unlock. For more information, see Sector. To assign a guard to an area, left click on it. A circle will appear near the sector's center. If the circle turns blue, a guard is available to be stationed in the area and will make their way to the sector. Upon arrival, they will walk around in the sector, and return to the middle upon completion of a job. If the circle appears hollow, a guard is not available to guard that area. To deassign a guard from a sector, right click on the area. You should usually not assign all your guards to certain areas, but let some of them spread around to be able to help where needed (e.g. escorting prisoners or stop fights). To create patrols, left click and drag your desired route onto the deployment map. 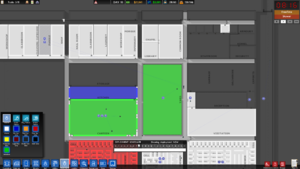 Guards assigned to the sectors in which the patrol is located will not automatically follow a route, and instead must be assigned to a route directly by clicking on an existing patrol route square. This will assign a guard to patrol, in addition to any guards stationed in the sector. To remove a patrol route, right click and drag over the route you want to delete. Routes may cross over any number of sectors and lead through doorways. To create Dog patrols, left click and drag your desired route onto the deployment map. Dogs must be assigned to a route directly by clicking on an existing patrol route square. This will assign a Dog and a Dog Handler to patrol. To remove a patrol route, right click and drag over the route you want to delete. Routes may cross over any number of sectors and lead through doorways. Much like Dog Patrols, left click and drag your desired route onto the deployment map. To remove a patrol route, right click and drag over the route you want to delete. You can create floor signage for Prisoners and everyone else. Floor signage provides a way for you to give hints to people as to which way they should travel around your prison. People tend to follow the directions unless a much easier/shorter route is available. Misbehaving prisoners, doctors on the way to heal someone, and all type of Emergency callout units ignore the floor signage. Everyone will also ignore the directions if there is a riot occurring. To paint lines, simply select one of the two tools, and left-click and drag in the direction you want people to go. Right-click and drag to remove paint. If Micromanagement is researched from the Bureaucracy tree, you can schedule the assignment of guards and patrols using the deployment scheduler at the bottom of the deployment screen. In addition to the standard deployment (white), you can configure up to 7 special deployments (1-7). Each hour can be assigned one of the configurations, by clicking on the rectangle below the hour (left - increase, right - decrease). The red arrow on the hour bar can be set to a specific hour to show and edit the associated configuration. The white arrow points at the current hour, the red arrow can be moved around to show the deployment at that time. Station guards in communal areas where fights often break out, such as canteens or showers. Avoid assigning all of your guards to an area. Allowing some guards to roam freely around the prison is useful for escorting prisoners, conducting searches, and responding to emergencies, because often guards who are stationed in an area will not respond. When creating patrol routes that cover large areas, such as the yard, assign multiple guards to the sector and create smaller routes that cover small portions of the entire area. Create a patrol route that loops around the prison to provide perimeter security. If you have the money, consider adding a double row of fences, and installing paths and lights between the two fences in order to enhance the security of your border. This page was last edited on 29 June 2018, at 10:40.